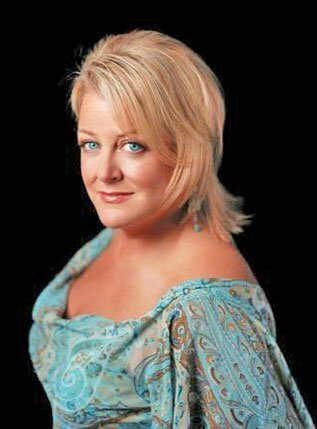 Renowned soprano Deborah Voigt wants people to know her life story. Her memoir will come out next year (Harper Collins), and in the meantime, only a few lucky audiences, such as those at Glimmerglass in the summer of 2011, have seen her 75-minute musical memoir, “Voigt Lessons,” which the Celebrity Series presented at the Calderwood Pavilion at the BCA Thursday and Friday. Co-created by Glimmerglass’s Artistic and General Director, Francesca Zambello, playwright Terrence McNally (whose 1995 homage to Maria Callas, “Master Class,” was among his many theatrical achievements), and Deborah Voight, the evening is an enchanting way to get to know the story of the effervescent diva Debbie, as she calls herself here. Voigt has had a fascinating past, as many divas have, and after a snippet of the thrilling “Dich, Teure Halle” (from the second act of Tannhäuser), she declared “enough of this,” and started opening up about her life. Voigt is unusually candid about her climb to the top, and the troubles and heartaches she encountered en route. “I am a romantic soprano. That means I sing a lot of Strauss and Wagner and get paid for it.” Later she asked why we can’t choose our voice. “Our voice chooses us” was her answer. With her excellent accompanist Kevin Stites, she sang pieces that meant a lot to her—Broadway tunes, inspirational songs, art songs (Brahms and Strauss). If you want Schubert, this was not the place, she flirted. “But there must be a Schubert recital somewhere!” she said snidely. Who could have guessed how much a singer who died from anorexia at age 33 (Karen Carpenter of the 1970s duo, The Carpenters) meant to this diva? “She was my guardian angel,” she recalled, and sang a Carpenter song, wistfully. Her mother, we learn, was the first person to notice Voigt’s voice. In Wheeling, Illinois, where she grew up, she got experience singing in Baptist church choirs and in high school musicals. “Do you think it’s easy meeting someone when you’re a diva?” she asked, launching into “Matchmaker, Matchmaker” from Fiddler on the Roof, which she performed in “an all-goy cast.” To her eternal chagrin, her family moved to embarrassingly named southern California town Placentia. “I always say I’m from Laguna,” she confided. At the age of 16, she fell in love with “an older man, Mr. Wonderful,” who was all of 21. They met at a car wash. “It was my big secret, the first of many secrets I’d have in my lifetime. He gave me a way to get out of myself,” she recalled and launched into a beautiful Brahms song with several stunning high A-flats. “Mr. Wonderful and I had 20 years together. We were both clingers.” He was a man who liked heavy women, sometimes referred to as chubby chasers. He finally admitted to having an affair with her best friend. “Why is it always a friend?” Her fans laughed, knowingly. Voigt charged, Brünnhilde-like, to the heart of her troubles—her weight and her alcoholic past—with unusual candor. The audience, made up largely of die-heart fans, adored her already. Her brute honesty brought them into an Oprah-like confessional which made them love her even more. The 18 songs, delivered with humor and heartfelt sentiment, were almost an extra treat. Voigt used to make her grandfather tear up when she sang “Edelweiss,” the last song Rodgers and Hammerstein wrote together (for The Sound of Music) and I suspect several in the audience had the same reaction. ”Moon River” was followed by Stephen Foster’s “Beautiful Dreamer,” which she sang in the 1990 Tchaikovsky Competition in Moscow. She won the Gold Medal. “Show Me” from My Fair Lady received a sassy treatment, and “Smile” by Charlie Chaplin was deployed in three moody versions. Her voice stayed most impressive when, diva-like, she soared into her high register. “It’s remarkable what three letters (FAT) can do to a life,” she shuddered. At her highest, Voigt weighed 333 pounds. “I will never forget those three digits.” Of course, her most notorious role, from which she was fired, was also her signature role, Strauss’s Ariadne. She was hired by the Royal Opera in London in 2004, and was promptly fired for being too fat to fit into the tiny black dress that director Christof Loy had wanted his Ariadne to fit into. It was, as she recalls, the dress size heard around the world. She was the overnight darling of the media, but then decided enough was enough and underwent gastric bypass surgery, turning into the glamorous diva half her old size but with the same amazing voice. Christof Loy was a concept director. “I can’t sing concepts. Concepts are the refuge of directors who don’t trust the music. I sing notes.” Here’s a concept, she smiled, a gay Ring of the Nibelungen in which Siegfried wears a little black dress. The large gay contingent of the audience seemed delighted by both her and her idea. While most opera fans were aware of Voigt’s Little Black Dress episode, not nearly as many knew about her demons, emptiness, and self-disgust that were “helped” by alcohol. “I had everybody fooled, even myself.” But after a 36 hour blackout (“You can sing two ‘Ring’ Cycles in that time”), she found the eight words, “My name is Debbie and I am an alcoholic,” that would be her salvation. I would have liked “Nessun Dorma” to have been the show’s end—it was just perfect, but instead it was a gospel hymn, “His Eye is on the Sparrow,” “I sing because I’m happy, I sing because I’m free. His eye is on the Sparrow and I know He watches me.” I, for one, am glad she’s being watched. It’s got to be lonely at the top, and that’s where Voigt belongs. What a singer, what a lovely human being. I look forward to hearing her, once again sponsored by the Celebrity Series of Boston, in recital on April 27, 2014 in Symphony Hall. When she’s at her best, she’s unbeatable. And yes, she wore a black pants suit, and looked just great.